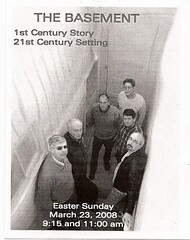 Today our church celebrated Easter through the presentation of a drama entitled 'the basement' The play closely followed the events in the lives of the disciples between the death and resurrection of Jesus, only changing the setting from a first century 'upper room' to a twenty-first century basement. The drama focused on the contrast of the despair of Saturday morning to the joy of Sunday. The characters of Peter and Thomas provided an emotional link to the audience. I played a minor role as the disciple, Matthew. It is good to be finished with the rehearsals, and we trust that the Lord used the presentation of 'his'tory to draw people to himself.